The story of Philomena shows former BBC journalist Martin Sixsmith (Steve Coogan) at a loose end after losing his job with the Labour government. When a dinner party waitress tells him about her mother, a retired nurse who had her child taken from her and put up for adoption by nuns in Ireland 50 years previously, he is initially dismissive of this mere ‘human interest story’. However, on meeting Philomena (Judi Dench), he is drawn into her story and the two set off in search of her son. 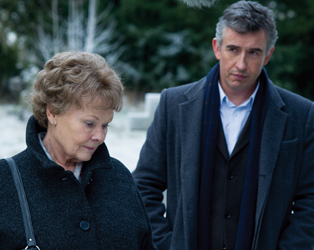 Philomena opens at the IFI on November 1st. To celebrate the release of Philomena, we have five copies of Martin Sixsmith’s book, The Lost Child of Philomena Lee, to give away, which the film was adapted from, courtesy of Pan Macmillan. To win a copy, just answer the question below before midday on Friday, November 1st 2013 and the winners will be announced shortly after. Q. What spy film series is Dame Judi Dench associated with?